Customers want good customer service, but if companies can just hire good PR people to cover problems up, how do we, as customers, ever demand that companies improve. We thought that a good start would be to close the information gap, so that customers know who is good and who isn’t. 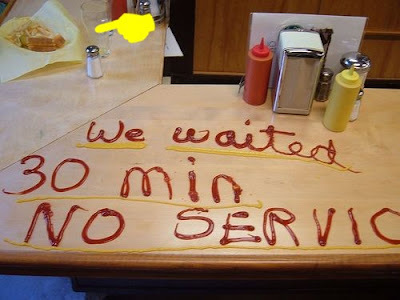 With that in mind, we have sifted through customer surveys and studies as well as some real-life experiences of customers, to come up with a list of the 10 best and the 10 worst companies for customer service. 1. APPLE – Dells’s loss, Apple’s Gain? The American Consumer Satisfaction Index (ASCI)* second quarter report indicates that within the Personal Computers category, customers perceived Apple as the best company in terms of customer service. Apple’s baseline score was 77 (on a 100-point scale), and the Q2 2006 score was 83. This 2003 article indicates that Apple is pretty consistent when it comes to high-quality customer service, “Apple did garnish the number one customer service ranking in the 2001 Consumer Reports Annual Questionnaire, and a number one ranking for desktop repairs in May 2003.” Here are some customer compliments for Apple. Another proactive measure adopted by GE CEO Jeffrey Immelt that promotes goodwill and customer satisfaction is the program wherein the GE Six Sigma black belts / management experts assist their internal customers in streamlining processes, cutting costs and increasing profit margins – all free of cost. Steven Pearlstein, in his article, ‘GE’s Wealth of Free Advice,’ illustrates the process. “Another happy customer is Stephen Carter, president of the American subsidiary of Komori, a Japanese maker of printing presses… GE’s Six Sigma "black belts" saw that most of the orders that took longer involved items that were out of stock. After analyzing more than a decade of parts orders, they found a way of ensuring that the most-sought items, or those with long lead times, were never out of stock, while reducing inventory for slow-moving and less hard-to-replace components. The result: 95 percent of orders now go out on time.” With this kind of commitment to improving the customer’s experience, it is small wonder that GE tops the popularity list for consumer durables. Search engines Q2 2006 score of 81. The google experience is a classic example of a company committed to wowing its customers based on consistent quality and constant innovation over the years. 2006: Google continues to retain the leadership position in the search engine category, with a Q2 2006 ASCI score of 81. Cox Communications is a king when it comes to customer satisfaction – it ranked first in customer satisfaction in the fixed line telephone service provider category. It reflected customer satisfaction in areas such as customer service, billing, performance and reliability, company image and cost of service. However, the Q1 2006 ASCI score of 76 is well below the average score for other industries. And with options such as VoIP and mobile phones now available to customers, the paying attention to customer service has become more important than ever. Wake up, fixed line telephone companies! Innovation combined with a desire to better the customer’s experience is apparent in Hilton’s programs like the Hilton Technology Room, which is basically a laboratory for gathering customer feedback on new and emerging technologies. “"In its current iteration, the Hilton Technology Room blends high-tech features into a luxurious guestroom setting, enabling us to gain insight into how guests interact with the technology and which pieces would be appropriate for full-scale deployment to our hotels." In With an ASCI baseline score of 75, the hotels segment too could do with improvement! With a Q1 2006 score of 79, Papa John’s leaves behind larger pizza rivals Pizza Hut and Domino’s, and also Starbucks, in the limited service restaurants category. 9. THE DIRECTV GROUP, INC. – Can do better! “As of June 2006, DirecTV has 15.4 million subscribers, more than any other in the satellite industry, having subscribed their 15 millionth customer in November 2005.” Though direcTV is ranked no. 1 in the cable and satellite TV category, the ASCI Q1 score of 71 indicates that customers are far from happy with the overall standard of service in this industry. 10. SAMSUNG ELECTRONICS AMERICA, INC.
With an ASCI Q1 2006 score of 73, Samsung is the number one cellular phone company in the industry. Again, 73 means that there is lots of room for improvement! 1. AOL – Playing Dirty, Tricking Customers? An overwhelming majority of netizens have had bad experiences with AOL – especially while closing their accounts. Listen to Vincent Ferrari’s conversation with AOL CSR John here. When a company believes it can retain customers by antagonizing them, something is very wrong with their customer service policy. Also, AOL is not above tricking customers into buying stuff online that they were only browsing. 2. BEST BUY – Worst customer service? A whole lot of customers are unhappy with the company, mainly because of the customer service policies. When your insistence for selling protection plans drives away customers, you need to rethink your policies, buddy! And what’s with all the sour faces, guys? Do they treat you so bad at best buy? Read this customer’s experience with Sour Face Jim and Handshake John at Best Buy. 3. LASTMINUTE.COM – Customer who? 4. HOME DEPOT – Who cares about your home? Not us! Americans ranked Home Depot’s customer service as dead last, according to Steven Silvers. Home depot customers complain about the worst service they received from the company. 5. AT&T – The Next Dinosaur? 6. SBC - $200 to cancel the service!!! While this customer was told to “go back to China,” Stan Dulkiewicz of Rochester was denied the one night free stay that he was entitled to. "Albertsons’ pharmacy customers receive direct mail and phone solicitations derived from confidential customer medical information provided to the pharmacy solely to fill prescriptions. The solicitations look like they are from the patient’s concerned local pharmacist and remind the customer to renew a prescription or consider an alternative medication. But they are actually generated for pharmaceutical company’s sales purposes by a specially-designed marketing database, sold by Albertsons." The most frequent violation by the company involved the continued billing of customers who had cancelled the phone service. Here are some MCI customer complaints. 10. CIRCUIT CITY – We have your money – now get lost! One example of the many disgruntled Circuit City customers – Though it was acknowledged that the laptop purchased by Matt Southerton was defective and no other pieces were in stock, the customer service rep refusing to refund his money. And if you’re thinking about purchasing their extended warranties, stop for a moment and read about John Alexander’s interactions with the company when he tried to (and deserved to) get his TV replaced. * The University of Michigan compiles the ACSI in numerous product categories by randomly calling U.S. residents and surveying their buying habits.